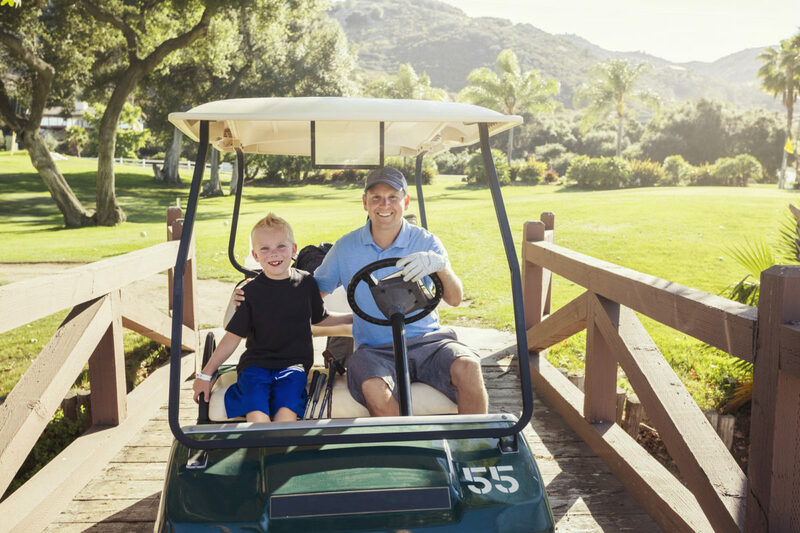 Are you thinking about getting a golf cart for your child? Before you go out and make start looking, it’s important to do some research on the different options out there. Electric golf carts are a convenient way to get your kids out of the house. In addition to being convenient, they’re also easy to maintain and a blast to ride. But finding the right one is important to ensure that they’re safe while they’re having fun. But what should you look for in an electric golf cart? Read on for the best features that you should be looking for in a kids electric golf cart. One of the first questions kids will ask is how fast can the golf cart go? Speed is an important factor in choosing the best electric golf cart for kids. How fast the cart can go is an important factor for a number of reasons. A golf cart’s speed can be a major selling point for some people. But what you look for in a golf cart’s speed can be very different when you’re shopping for your child. But luckily, most of the golf carts made for kids were designed to keep them from going too fast. On average, child-sized golf carts won’t go much faster than five miles per hour. While they won’t be able to move fast enough to hurt themselves, they can still enjoy their sweet new golf cart. The number of seats your child’s golf cart can also influence your decision. After all, what’s the point of buying a golf cart for your children if they can’t share with their friends? Golf carts that were designed for kids typically either have one or two seats. While having two seats can make it easier to encourage sharing, single-seat carts can still be fun for the whole neighborhood. The number of seats your golf cart has will depend mostly on the size of your family or neighborhood. If your child will be around other kids with the cart, having more than one seat may be helpful. But at the end of the day, having a single-seated golf cart is better than not having one at all! The types of batteries your golf cart uses can be a very important part of the decision. The strength of the battery determines how well it can hold a charge. Picking the right amount part is an essential part of choosing the perfect electric golf cart for kids. Not only will it determine how long the battery will run, but it’ll also affect how long it takes to recharge. Golf cart batteries typically come in 6 volts or 12 volts. Batteries vary from cart-to-cart, but the differences aren’t as noticeable as you’d think. Your battery’s power will mostly affect how long its life and recharge time. Another factor to consider when choosing a battery is whether it’s “deep cycle” or not. Deep cycle batteries use more of the battery’s capacity than normal batteries. These kinds of batteries are more versatile and can endure more over longer periods of times. But batteries aren’t the only factor that affects the golf cart’s performance. There are also many differences between electric- and gas-powered carts. There are two types of golf carts out there: electric and gas. While both work well, they do have their differences. But which one should you get for your child? Electric golf carts rely on the batteries to run. Not only are they a little bit cheaper, but they’re also more convenient. While they won’t move as fast as a gas-powered golf cart, electric carts will still get the job. They’re easier to maintain and can prevent your child from driving too fast. Gas-powered carts usually a little bit more of a hassle to keep up and running. While you won’t have to deal with charging batteries, there is much more maintenance that needs to be done. In addition to doing regular oil changes and tune-ups, they’re more expensive to have around in general. While electric golf carts for kids aren’t the best electric utility vehicle on the market, they are convenient and child-friendly. The fact that they stay at fairly low speeds and are easy maintain makes them an ideal choice for most families. The top priority when shopping for a golf cart for your child is safety. While you want your children to have fun with their new vehicle, you also want them to be safe. Luckily, there are a number of different features that help make the ride a little bit safer. One thing to look for in a cart is seatbelts. Passenger ejection is a major issue in golf cart accidents out there, especially because they aren’t required to be installed. But even if your golf cart doesn’t already have seatbelts installed, you can create your own restraints to ensure your child’s safety. There also general features like brakes and headlights that can affect safety. Being able to see and stop are essential functions for a golf cart, especially if it’s taken out of the yard and into the neighborhood. Doing the necessary research on the golf cart you’re looking at is an easy way to ensure they’re safe for your child to use. Take the time to look at reviews and read through different product descriptions to see what kinds of features the cart has. Golf carts can be a great investment for any family. They’re a fun way for kids to get around and get outside. But picking the right right kids electric golf cart can be a difficult decision. The perfect electronic golf cart for your children will not only be easy and convenient to maintain, but it will also be safe. Taking the time to research your different options is the best way to ensure that your kids enjoy their new ride. Are you looking for more fun family bonding activities? Visit our blog for more great ideas for you and your family.